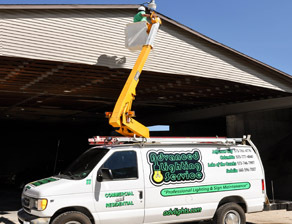 Advanced Lighting Services offers comprehensive service and maintenance for all of your lighting needs. Our highly trained and certified technicians will arrive promptly with fully stocked trucks ready to complete your job right the first time. Our technicians will have clear and concise answers to all of your service and maintenance questions, as well as providing you with information to strategically reduce your energy costs.